Ms. Doris Taylor-Irby is President of the Angelic Gospel Choir (The Mt. Carmel Choir). 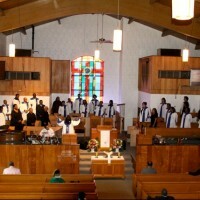 This is our largest and premier adult Choir that gives glory to God through the eclectic singing of Hymns, Anthems, dynamic Gospel rhythms with three and four part harmony.